You may be considering adding a business security system to your operation to help protect your employees and your assets. In this post, we discuss the benefits of having multiple security systems working together to protect your business and provide a safer environment where no threat goes undetected. These include but are not limited to burglary, fire, employee theft, and vandalism. Safe Systems Inc. (SSI) is prepared to equip you with an alarm system, security cameras, and access control to protect against any threat. 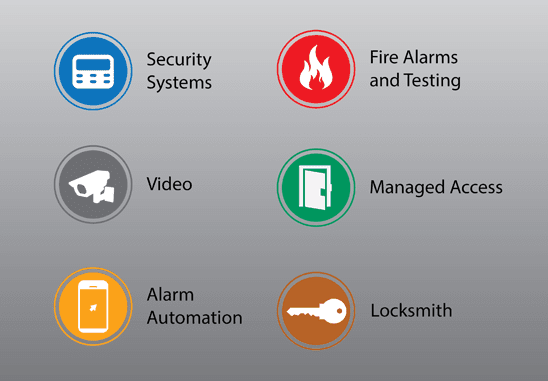 Have you ever considered the value of an integrated security system where all of these work together? Let’s go over the different functions of an integrated security system. Security Cameras provide a deterrent. Cameras show who is entering and exiting and will record it. Without security cameras, threats may go unnoticed. With cameras, you are allowed the ability to verify if something happened, when it occurred, and who was involved. At SSI we are prepared to equip you with all of the necessary components of having a reliable camera system. With our systems, you can view your cameras feeds from anywhere using computer software and phone applications. Fire and temperature detection devices offer warnings of environmental threats. Our monitoring station is prepared 24/7/365 to take action on any threats that are alerted to them. These devices can save your company from damages caused by frozen water pipes or even detect an issue with your furnace. SSI has devices such as smoke & heat detectors, sump pump alarms, and temperature monitors to help save your business from unexpected damage. Perimeter protection and access controls allow only those who are authorized access to your building. Our access systems are here to help get your properties safe. With access control, you can keep access to specific areas limited to only those necessary. Installing an intercom system at your business allows you the ability to communicate with your visitors before allowing them access inside. With an integrated system, all systems work together to protect your facility and its occupants. The well-rounded protection from multiple devices help to keep a safer environment; protecting lives, property, and inventory. Safe Systems is a one-stop shop for all of your security needs. Everything from design, installation, and testing of security equipment will be provided by Safe Systems.